Built out of 416 Stainless Steel, these rings are designed to last and mount directly to SRAM cranks with replaceable spiders. These rings feature Drop-Stop tooth profiles for mud clearance, chain retention and durability. made out of 416 Stainless Steel for superlative durability. Not compatible with 9 speed chains. 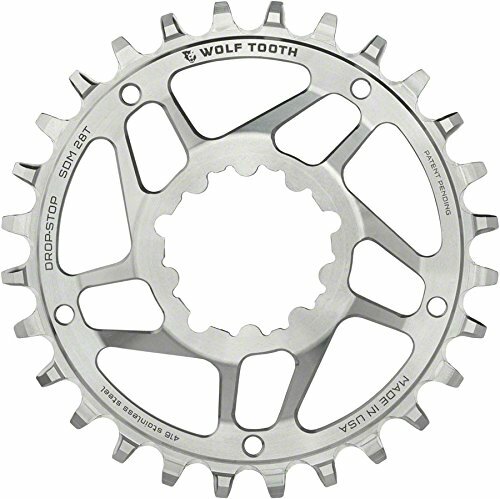 Features Wolf Tooth's Drop-Stop tooth design for maximum chain retention. Optimized for use with 10, 11, and 12 speed chains. Material: Stainless Steel. Offset: 6. Defined Color: Silver. Ring Position/TYPE: Chain Retaining Single Ring. Drivetrain Speeds: 10. Drivetrain Speeds: 11. Drivetrain Speeds: 12. Tooth Count: 26. Direct Mount Type: Direct Mount SRAM. Round or Oval: Round. Chainline/Hub Compatibility: 135/142 MTB Hubs. Chainline/Hub Compatibility: 150/157 DH Hubs. Chainline/Hub Compatibility: 170/177 Hubs.